Birth Date: Friday July 03, 1903. Date: Wednesday September 02, 1925. Date: Saturday May 01, 1926. Date: Saturday July 22, 1933. Date: Friday July 17, 1936. Date: Wednesday January 18, 1939. Date: Sunday July 02, 1995. "Indiana, Marriages, 1811-1959," index and images, FamilySearch (https://familysearch.org/pal:/MM9.1.1/27V7-4SD : accessed 17 Feb 2014), Jack Eighner in entry for Clarence Eighner and Marie M Grafelman, 1925. 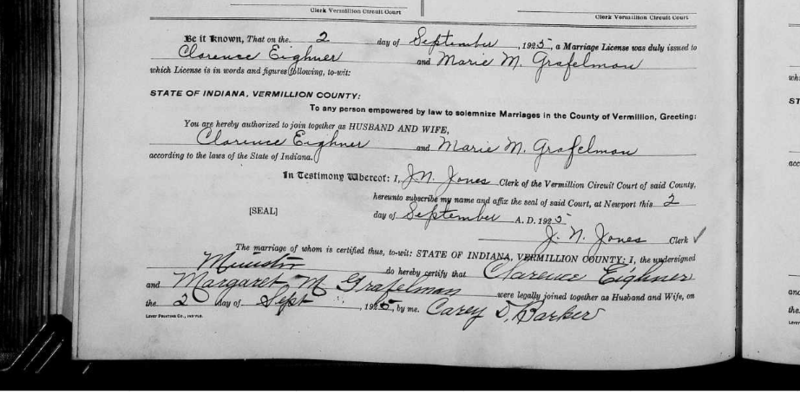 Also: "Indiana, Marriages, 1811-1959," index and images, FamilySearch (https://familysearch.org/pal:/MM9.3.1/TH-1971-26831-947-53?cc=1410397&wc=M944-S86:1731063661 : accessed 17 Feb 2014), Vermillion > 1923-1928 Volume 6 > image 175 of 336. State Illinois, County Vermillion Township or other division of county Butler Township Precinct 2. Name of incorporated place East Lynn Town. Ward of city [blank]. Name of institution [blank]. Enumerated by me on the [blank] day of January, 1920, Chauncey D Greys (? ), Enumerator. Census Image Also: "United States Census, 1920," index and images, FamilySearch (https://familysearch.org/pal:/MM9.1.1/MJCB-VX4 : accessed 18 Aug 2013), Elija Grafelman, 1920. Congratulations, Rankin, on your 100th year. We are only 25 years behind you. Stories of a Prairie Town: History of Rankin, Ill. Rankin Centennial History Committee, (1972: Rankin, Ill., Rankin Centennial History Committee). Blind folio, 108.